I have created a new presentation using ArcGIS Online to invite exploration of the spatial aspects of baseball teams, players, stadiums, and the sport itself. The goal of the presentation is to use the familiar and interesting topic of baseball as a starting point for exploring spatial data at a variety of scales, to ask geographic questions, and to use WebGIS in the process. Baseball is a spatial sport. The bases are a standard “space” or distance apart, the fielders are assigned certain locations on the field, the offense has a prescribed direction to tag and run the bases, and the players, umpires, coaches, and warm-up pitchers have prescribed areas in the stadium in which to work. Even the fans have certain areas in which they can sit, and the proximity to the field and other amenities determines the ticket price. Angles are of crucial importance as the ball is thrown, hit, and fielded. In short, spatial considerations run throughout the sport of baseball. Baseball stadiums are constructed in certain locations and markets and affect local and regional transportation patterns, local economies, land use, and even local drainage and impervious surface. The birthplace of players and affiliated radio and TV stations also form regional and, these days, even international patterns. The presentation includes discussion and data on the distribution of radio stations broadcasting major league baseball games, the distribution of the birthplaces of baseball players, population density and neighborhood characteristics, access to and proximity of stadiums, comparing stadiums in different cities, comparing different types of sports stadiums, and much more. A total of 7 videos linked to the presentation invite deeper reflection. Spatial questions are embedded throughout the presentation. Actually, the word “presentation” does not adequately fit the wonderful and powerful capabilities built into ArcGIS Online. This presentation includes 53 slides, but at any point, the user of these slides can exit the presentation mode, zoom and pan, add additional data, change symbology, change the base map, or examine a different issue. The presentation mode in ArcGIS Online can serve as an excellent storytelling tool for students studying biology, chemistry, geography, history, mathematics, as well as a convenient and authentic means for instructors to assess student work. 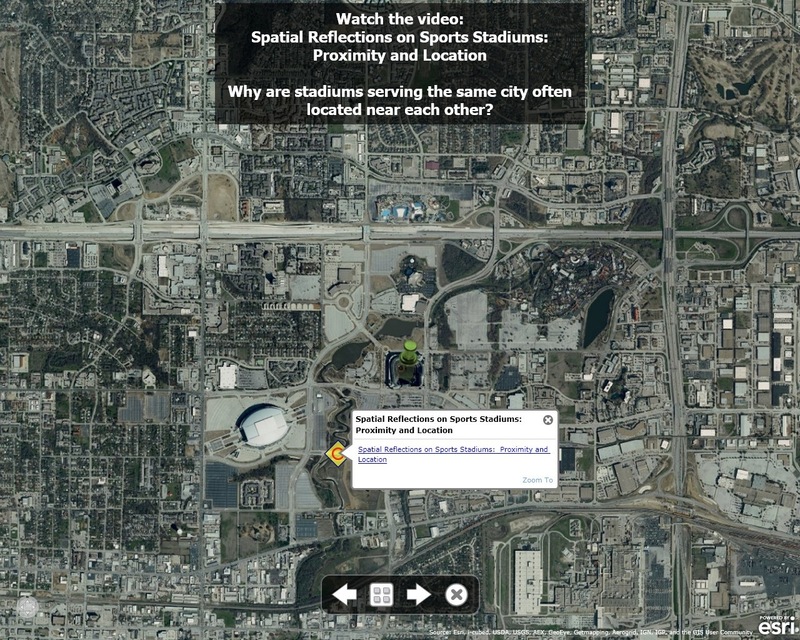 How might you use this activity, and ArcGIS Online, to promote spatial thinking through sports?